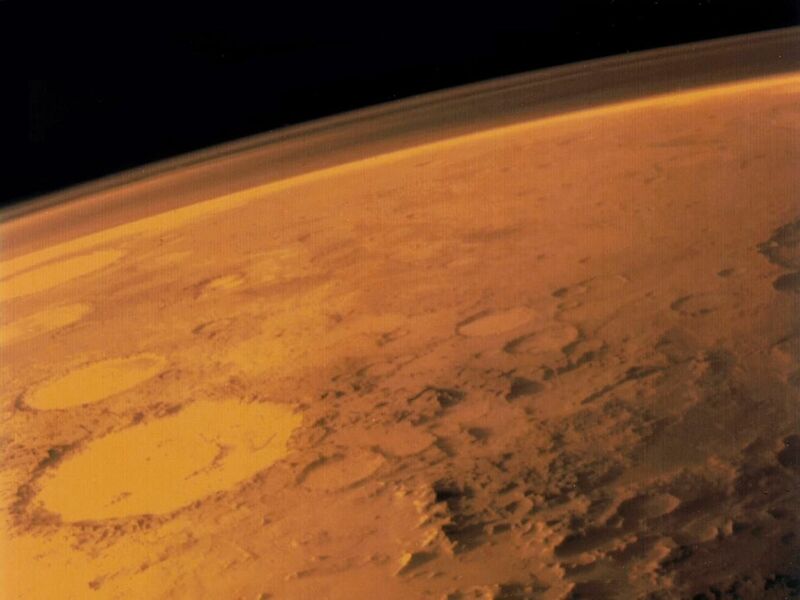 Where Did Mars' Atmosphere Go--And Is Earth Next? Last week, NASA's Mars Atmospheric and Volatile Evolution (MAVEN) mission identified the smoking gun in the whodunit mystery of what happened to Mars' once much warmer, thicker, and more Earth-like atmosphere. As some suspected, it has slowly been blown into space by energetic particles of the solar wind. Turns out the sun did it! My money was on the butler…. In the saga of our exploration of Mars, which has unfolded over the past five decades since the first robotic probe sent back images taken at close range, our understanding of Mars has improved dramatically. Early missions reported a dry, cold desert planet with an atmosphere a hundredth as thick as Earth's, composed mostly of carbon dioxide. More recently, missions in orbit and on the ground have churned up a preponderance of geological evidence that long ago liquid water flowed across Mars' surface, filling large lakes and even shallow seas—an environment that may have been suitable to sustain life. The very presence of liquid water in Mars' past tells us that its atmosphere had to be much more substantial at one time--thicker, warmer. So a big question has been, what happened to the atmosphere? Understanding what is responsible for the drastic difference between the cold dry Mars we see today and the warm and wet Mars of the distant past is key to answering important questions not only about Mars, but our home planet as well. Might Earth someday fall victim to a similar crime? Is there a serial killer of planetary atmospheres on the loose, and should people on Earth start stock-piling tanks of air and water against the prospects of a Martian-esque future? MAVEN was the first spacecraft ever sent to explore the uppermost regions of Mars' atmosphere, where it comes into contact with the environment of the solar wind. It was believed that the answer to the mystery might be found in this region, but on-site forensic work was needed to prove it. The solar wind is a continuous flow of high-speed, electrically charged particles (plasma) and magnetic fields exuded by the sun. Blowing by with an average speed of about a million miles an hour, the solar wind affects the entire solar system, including the Earth. All of the objects in the solar system, even far beyond Pluto, are within this outflowing "bubble" of plasma. How Does the Solar Wind Affect Us Here on Earth? Here at home, we can see the effects of exceptional solar wind activity: dazzling auroras around Earth's poles, and "geomagnetic storms" (fluctuations in Earth's magnetic field) that on rare occasion have knocked out power grids. These effects, however, are not the result of the solar wind hammering away at our upper atmosphere, but by its interaction with Earth's more extensive magnetic field. Earth's atmosphere, for the most part, is safely tucked away within our planet's great magnetic deflector shield. Mars, however, does not enjoy the same protection. Mars, at present, has no structured global magnetic field as Earth does—the kind with north and south poles and an enveloping donut shape, like a textbook bar magnet. With respect to the solar wind's abrasive action, Mars' deflectors are down. 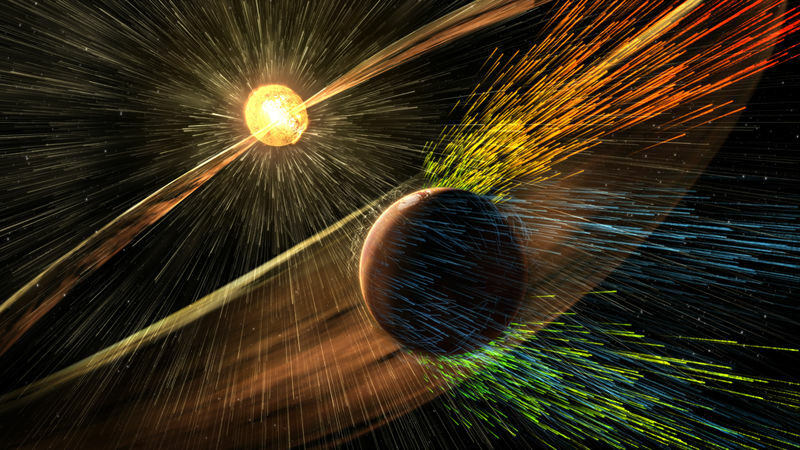 Scientists had hypothesized, and now MAVEN has verified, that the energetic ions of the solar wind coming into direct contact with Martian atmospheric atoms result in those atoms being kicked off into space, thus slowly leaking away at Mars' atmosphere. How Bad Is the Leak in Mars' Atmosphere? 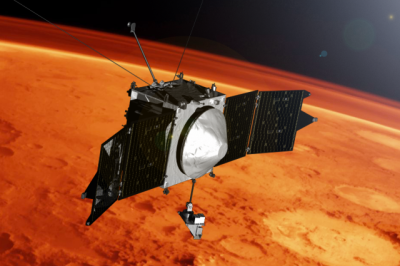 MAVEN has detected the amount of atmospheric gases escaping from Mars: around 100 grams per second. About three-quarters of the loss occurs through a long "tail" extending away from the sun's direction, and another quarter through a plume spewing off of Mars' polar region. MAVEN has also found that the loss rate rises dramatically when solar wind activity increases, such as during solar storms. With this insight, we can now envision how Mars probably lost a major part of its atmosphere in the solar system's younger days, billions of years ago, when the sun was more active and the solar wind more abrasive. Though our understanding of exactly how Mars lost its water-supporting atmosphere won't bring it back, it may help us better understand what Mars is all about today, including how we might go about looking for any remnants of its global paleoclimate. Recently, NASA's Mars Reconnaissance Orbiter confirmed the presence of trickles of briny liquid water seeping in certain spots on Mars today—a discovery that has scientists interested in finding signs of life on Mars very excited.